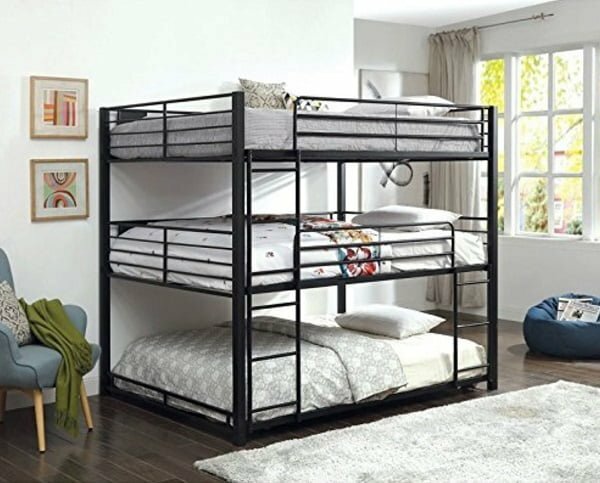 Looking for the best triple bunk bed for your kids’ bedroom, vacation house or guest room? 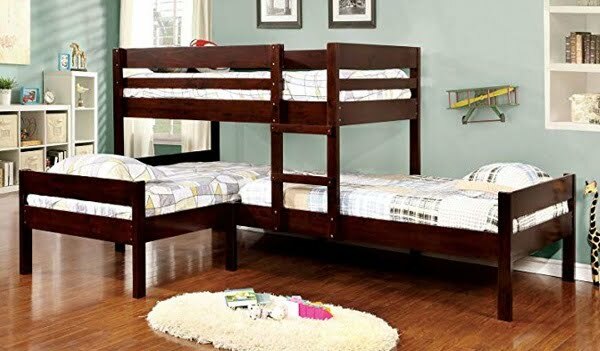 We’ve got you covered with these top 10 best rated triple bunk beds in 2019. Choosing a piece of furniture can be quite a task, especially when it comes to untraditional furniture like a bunk bed. How do you pick one that is sturdy enough yet doesn’t become an eyesore in room’s decor? You have to think about its multi-purpose as well. This is precisely the criteria that we’ve used to find the best beds. 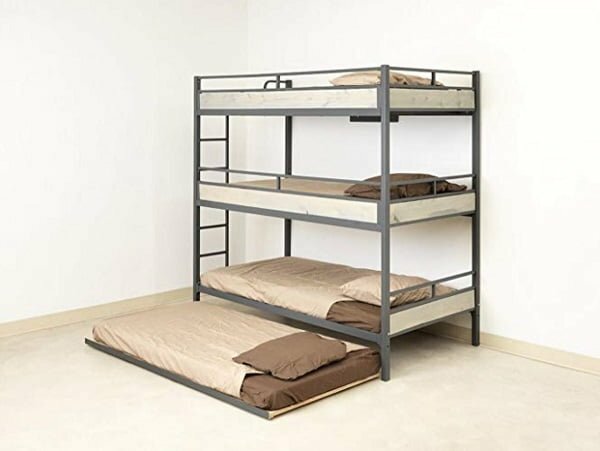 We’ve gone ahead and examined a lot of triple bunk beds available to buy online to come down to the list of top 10. And here it is for your convenience. While the list is not ranked, each of these beds can be considered the best in their category. A bunk bed has to be comfortable and safe for kids. That’s especially true when we’re talking about a triple bunk bed. 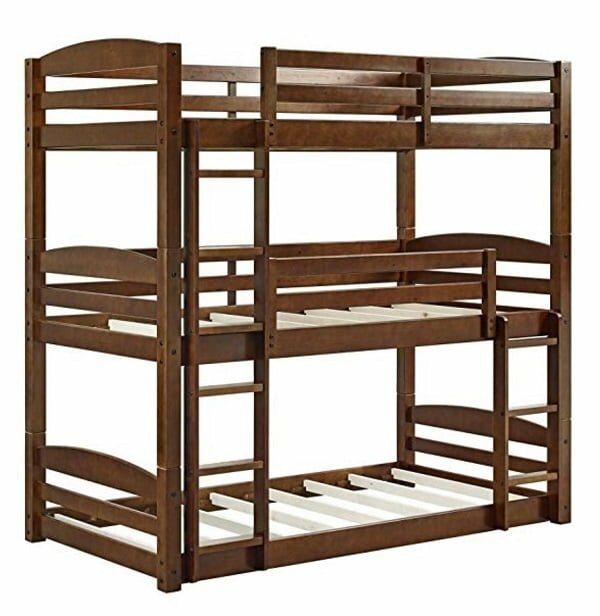 This Dorel Living triple bunk bed is precisely that. As a well-made product, it will accommodate any big family home or a vacation house. Your kids will have their own private space in this bed even if they have to share a room. The design allows you to separate the beds into single beds thus giving you an option to create the usual bedroom set up. When needed you can stack them up again. Or use a double bunk bed and a twin bed at the same time. Why it’s our pick? It’s an all-in-all perfect multi-functional bunk bed. You get way more than you pay for. It’s a well-rated product for a great price that you and your kids will love. Available on Amazon.com. Sometimes you need an extra sturdy piece of furniture, especially when it comes to accommodating kids. 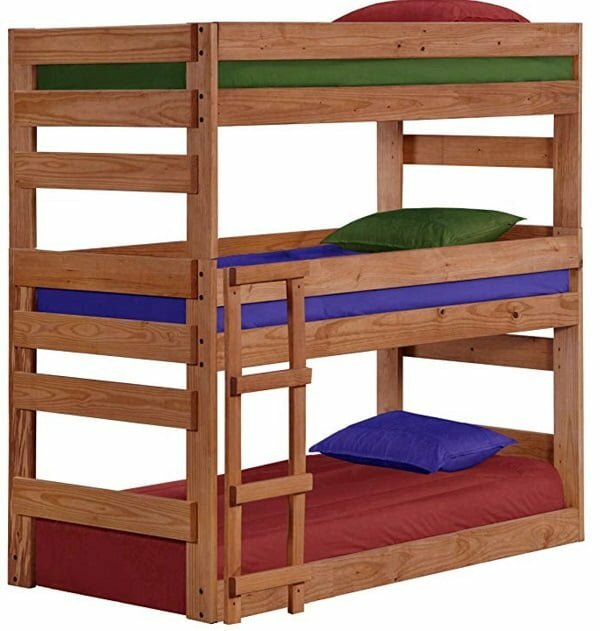 This triple bunk bed is made of solid pine wood and is sure to hold up to 200 lbs. That’s a lot for kids! The design allows you to configure the bed in any way you need too. Use it as a bunk bed and reassemble it as single beds as your kids grow. The bed is good looking in classic style. Your kids will get excited about it. Why it’s our pick? It’s a sturdy and durable choice. Nothing can beat solid wood. The bed works for its purpose and solid pine looks good in decor. It’s available on Amazon.com. 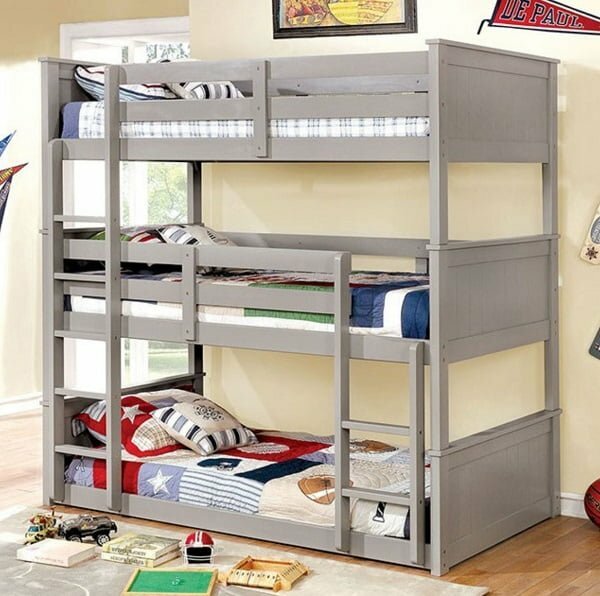 L-shaped triple bunk bed design comes in help when you need to save vertical space. This Furniture of America bed is twin over twin double layer bed. It provides only one configuration, but it’s perfect for corners in a small bedroom in a sturdy build. The bed is made of solid wood with veneer detail. It’s durable and looks good in traditional style. You’ll place it in just about any decor style without a clash. Why it’s our pick? 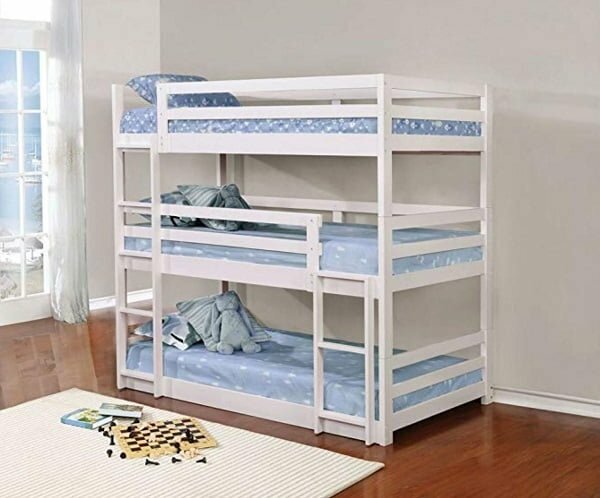 It’s a great L-shaped triple bunk bed for small spaces. It’s sturdy and durable. The reviews of people who already bought it are stellar. Available on Amazon.com. So you’re looking to accommodate as many kids as possible. Perhaps in a vacation house or at a kids’ party. You need something sturdy and stable. And you need room for more than three kids. This triple bunk bed with trundle will have room for 4! The bed is made of steel, and while it’s not configurable it will hold up to 400 lbs! The design is sleek, and kids love it. What more do you need? Why it’s our pick? It’s a great choice for any vacation home or a big family. This bunk bed is absolutely sturdiest on the list. Available on Amazon.com. Metal has that attractive industrial style that fancies up the bedroom decor. It especially works well if you have boys. The design is sturdy as well by its nature. 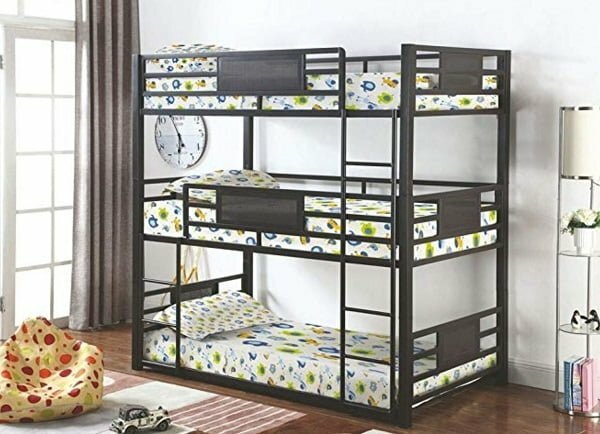 So this triple bunk bed is for those who are looking for something sturdy and stylish. The bed is configurable too, so you can easily separate it into three single beds. This will work so well once your kids grow older and have separate rooms. The product gives really good value for the money. Why it’s our pick? We love the combination of multi-functional and stylish design. It’s sturdy and flexible at the same time. Maybe the best bunk bed for boys. The bed is available on Amazon.com. Yes, you’ve read that right. It’s rustic, and we love it. The wooden design will fit any rustic farmhouse decor, and you’ll like it too. It’s perfect for that grandparents’ house whenever the kids visit them overnight. The solid pine wood build provides excellent durability and flexibility. It will hold its weight. If you want to take it even further, you can paint it or apply your finish. It’s solid wood, after all. Why it’s our pick? It’s the designer’s choice. This triple bunk bed gives you the rustic accent that you need. Who says bunk beds don’t work in decor? It’s available on Amazon.com. Taking functional design to the next level. Do you think your new triple bunk bed can do more than accommodate sleeping? This bed sure can! Here comes a triple L-shaped bed with a built-in desk. Your kids will be able to sleep and do homework in it. It’s a real space saver! The full metal construction makes a very sturdy piece of furniture and gives it a modern look. And while it’s not configurable, it will fit in any corner of a small room. Your kids will love it and actually enjoy sharing a room! Why it’s our top pick? The built-in desk is a winner. The metal construction makes it a high-quality product worth its price. Available on Amazon.com. The Templeton triple bunk bed is a decor-neutral addition to your kids’ bedroom or vacation house. The grey wooden veneer detailing will not stand out and keep your ongoing decor theme intact. So if you want to play safe, choose this bed. It comes in two sizes – twin and full. And it can be separated into a double bunk bed and a day bed any time you need. That makes it a great choice looking ahead. Why it’s our pick? 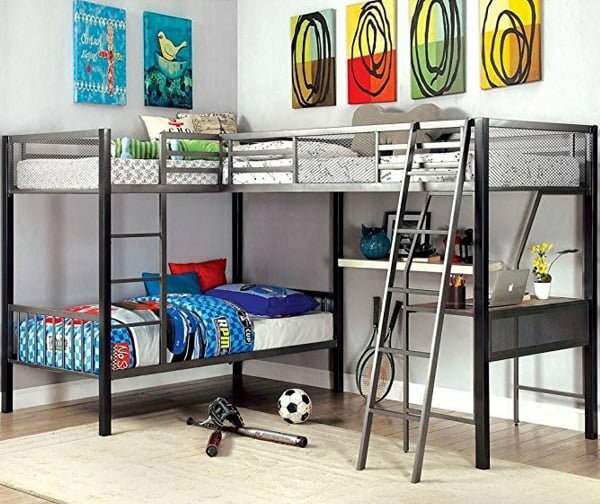 This triple bunk bed is a great classic choice if you’re looking for some multi-function too. Good value for the money. It’s available on Houzz.com. 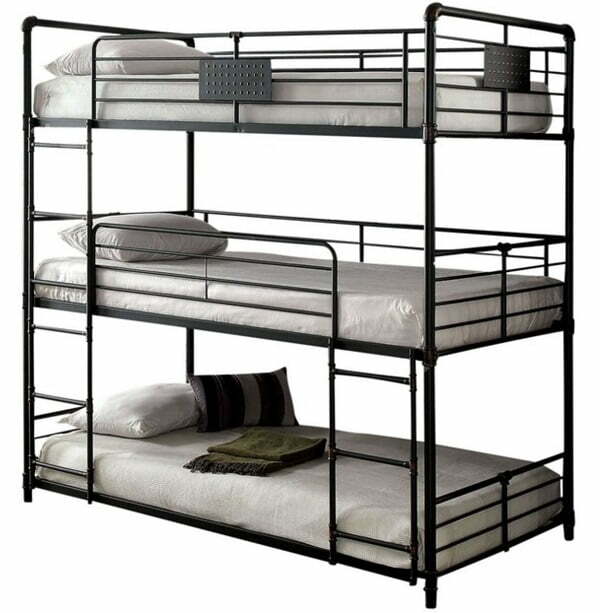 Vintage style comes back with this triple bunk bed. And it’s so attractive! The industrial piping bed in a dark finish with copper detailing takes us back decades. It’s a unique piece to add to your kids’ bedroom decor. You can bet they will love it! The metal frame is of course very sturdy and can hold a lot of weight. You can separate the beds into singles, but that’s not what you’d expect from this design anyway. It looks best when it’s put together! Why it’s our pick? You get everything you expect from a triple bunk bed. And you get an attractive vintage industrial design for your exceptional decor. Available on Houzz.com. While all other triple bunk beds on this list are for kids, this queen size bed can fit adults as well. So it can be a great multi-purpose addition to any guest room. It will save you a lot of space and will accommodate any guests you have staying over – kids and adults alike. The modern design will also fit in any contemporary home decor. You don’t have to worry about the piece of furniture becoming an eyesore with this bed. Why it’s our pick? If you need a triple bunk bed that can accommodate kids and adults alike, this is your best choice. Available on Amazon.com.